The Toyota Hilux is the most popular vehicle in Argentina in 2018. Consult over 55 years worth of Argentinean Historical Data here. This article has now been updated with the Top 333 All-models. The Argentinean new vehicle market ends 2018 with a 11% year-on-year drop – equivalent to almost 100.000 units – to 801.658 registrations. But the year had two distinct acts: at end May, the market was up 18% to an all-time record 431.479 units, but over the course of the following 7 months it would freefall 30.9% to 370.179 units, with the country’s precarious economic situation, rising inflation and the 55% devaluation of its local currency having finally caught up with the market. 2019 prospects are grim: a further 20% fall is expected to 650.000 units at best. Volkswagen (-17.7%) holds onto the brands pole position it has held every year this decade despite falling much faster than the market, but Renault (-0.8%) is catching up, gaining 1.4 percentage point of market share and overtaking Chevrolet (-17.7%) for 2nd place. Ford (-16.1%), Fiat (-12.4%), Peugeot (-15.5%), Citroen (-13.8%) and Mercedes (-18.9%) all implode in the Top 10 but Nissan (+34.1%) replaces Honda (-45%) among Argentina’s 10 most popular brand and Toyota (+0.9%) stays afloat. Further down, Dongfeng (+814%), Isuzu (+83.7%), Geely (+69.1%), Suzuki (+65.8%), Jeep (+63.4%) and Jaguar (+12.5%) are among the rare gainers. All newcomers are Chinese: BAIC (#27), Shineray (#35), Great Wall (#37), JMC (#38), JAC (#41) and Haval (#46) but they all remain at or below 0.1% share. All-in-all, Chinese carmakers (+18.6%), although very dynamic, only hold 1.3% of the Argentinean market in 2018 vs. 1% in 2017. 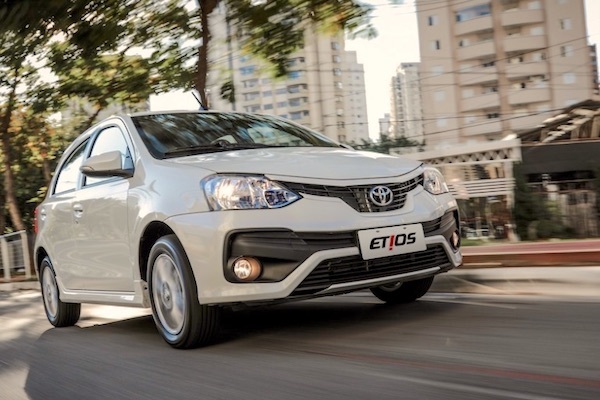 The Etios enables Toyota to score its first ever annual 1-2. 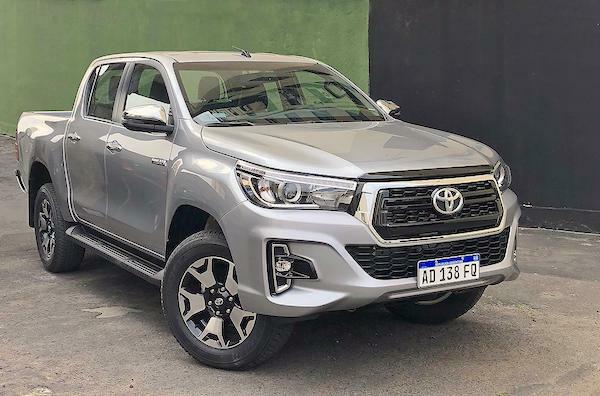 Once again the Argentinean models ranking is turned upside down this year: the Toyota Hilux (-1.4%) wins for the 2nd time in the past 3 years (and ever), Toyota even managing a first-ever 1-2 in the country with the Etios (-1.6%) placing 2nd. The Ford Ka (+8.6%) gains four spots to leap onto the podium while the Chevrolet Prisma (-0.6%) breaks into the Top 5 but the 2017 podium is in shambles with the VW Gol (-44.8%), Renault Sandero (-41.1%) and Chevrolet Onix (-14.4%) all enduring steep losses. Potentially responsible for the Sandero’s paltry score, the Renault Kwid (+5354.5%) posts a fantastic first full year in market at #7, peaking at #4 in October, just as the Fiat Argo (+1239.5%) also spends its first full year inside the Top 10 at #10 and the VW Polo (+418.2%) surfs on the arrival of the 2nd generation to gain 42 spots to #11. The Fiat Cronos (#20) is the best-selling 2018 launch ahead of the VW Virtus (#44), Chery Tiggo 3 (#64) and Chery Tiggo 5 (#68), keeping in mind the Tiggo lineup has been renamed for 2018. 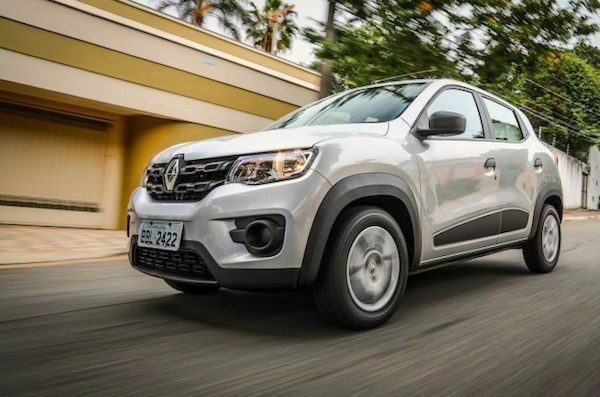 The Kwid has helped stabilise Renault sales in 2018. Full Year 2018 Top 60 All-brands and Top 333 All-models vs. Full Year 2017 figures below.